The first funerals for the 200 victims of the Madrid bombings have been taking place in the capital and across Spain. Reports from Madrid say the Spanish government is expected to announce imminently that it has made arrests in connection with the blasts. The reports on the website of newspaper El Mundo say four people of Arab extraction were arrested. Thousands of people have turned up at cemeteries, funeral homes and religious services to mourn those killed. Earlier, hundreds of protesters held a noisy rally in Madrid accusing the government of manipulating facts about the attackers. 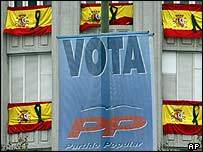 They told reporters the government had been trying to promote the theory that Eta was responsible for its own political advantage ahead of Sunday's general elections. The BBC's Katya Adler in Madrid says government officials have considerably toned down their confident declarations immediately following Thursday's explosions that Eta was definitely to blame. Meanwhile, the first funeral masses have been taking place in the capital and other cities. In Alcala de Henares, the commuter town east of Madrid where the bombed trains had started their journeys, up to 1,000 people crammed into a gymnasium to remember some 30 local people killed. "We have buried a son, 23 years old, a son full of his future," said one father dressed in black. "Alcala is broken," said Mayor Bartolome Gonzalez. In Tanatorio Sur, Madrid's biggest funeral home, lack of space meant coffins had to be placed in staff rooms. Distraught families have been coming to sit in vigil. "My son. Why?" one elderly woman sobbed. The funerals will continue throughout the day, with the last in the Basque city of San Sebastian scheduled for early evening. On Friday evening up to 11 million people turned out in heavy rain to protest against the violence in towns and cities across Spain. Reports suggest the bombings bore many of the hallmarks of an Eta attack, and several apparent bombing attempts by Eta agents have recently been foiled. And with elections due on Sunday, most Spanish politicians are still saying that Eta was to blame. Mr Acebes insisted that, although investigators were keeping an open mind, Eta remained the prime suspects. Basque media have denied that Eta was behind the blasts. And the BBC's Chris Morris says Saturday's protest in Madrid shows Thursday's tragedy is rapidly becoming politicised. The 2,000-strong protest was growing rapidly - with some scuffles between protesters and police. Protesters accused the government of covering up facts indicating that al-Qaeda was involved. A statement was sent to a London-based newspaper claimed that al-Qaeda was behind the bombings, and some Arab commentators in London said they believed it to be genuine. Most recently, a radio station claimed to have been told that investigators are "99% certain" of involvement by Islamic militants by an unnamed intelligence source, but this has not been confirmed. 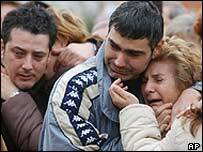 "Today, the first funerals of those slain in the Madrid train bombings"